There’s a category of recipes that I call “Basics”. They’re not in themselves complete recipes; instead, they are building blocks that help you assemble other recipes. The most obvious is stock (about which more later) but one less obvious one is tomato sauce. As any even semi-serious cook knows, the quality of your ingredients is key to the quality of your finished dish (or put another way, ‘Garbage in, Garbage out’). Getting your hands on really good fruits and vegetables can be a real issue, especially in the colder months. There’s always options, of course. When it comes to tomatoes, high-quality canned ones (especially Italian ones) can work really nicely. However, we’ve found that if you really want an intense, fresh tomato flavor in your dish, you can’t beat roasting. It makes good tomatoes better and makes passable tomatoes usable. Drizzle with a little olive oil. Roast in the oven at 350 degrees F for 60 minutes. 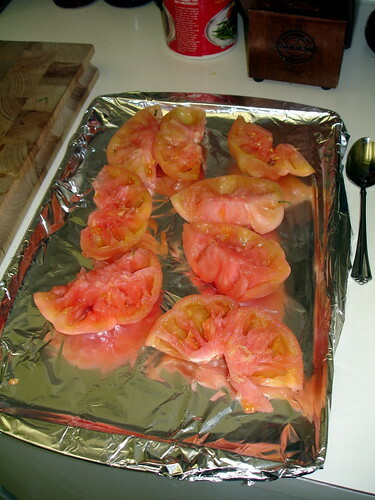 Remove the trays from the oven and allow the tomatoes to cool, then toss into a blender and puree. The result is an intensely flavored sauce that’s a good base for a lot of different preparations. I divide each batch of sauce into 2-cup portions and freeze them in separate freezer-safe baggies, then thaw and use as needed. NOTE: Roasting canned tomatoes doesn’t cut it (we’ve tried). This entry was posted on Tuesday, November 13th, 2007 at 7:42 am	and is filed under Basics, Veggies. You can follow any responses to this entry through the RSS 2.0 feed. You can leave a response, or trackback from your own site.